Follow through one traffic light. Turn RIGHT onto Pottle Street just before the Railrod tracks/2nd traffic light. Follow Pottle Street for approximately 0.5 mile. The Opachinski Sports Complex will be in front of you at the end of the dirt road. Follow Rte 106 East into Kingston. At END, turn LEFT at light onto 3A/Summer St.
Take immediate LEFT onto Pottle Street just after the Railrod tracks. 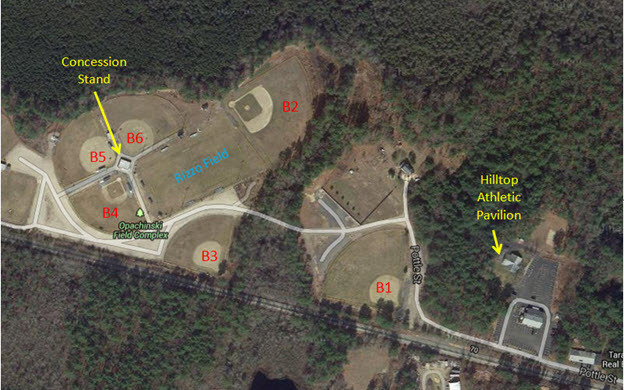 Softball games will be held on Fields B3, B5 and B6. Fields B1 and B4 will be available to teams for practice. Please respect the parking signage, especially the Umpire’s Parking Area.